Via mail-in form. 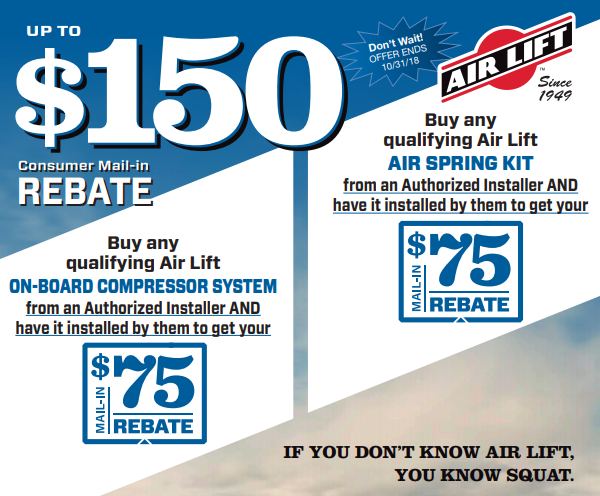 Get $75 back on qualifying on-board air compressors bought from and installed by an Air Lift Authorized Installer and $75 back on qualifying air spring kits bought from and installed by an Air Lift Authorized Installer. Offer good May 1 to October 31. Click image for printable form and complete details! Are you looking for a partner to help you outfit and build your truck for SEMA? 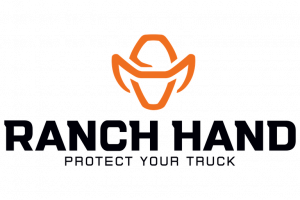 Do you need help getting equipped with product that not only looks sharp but will also protect your truck? 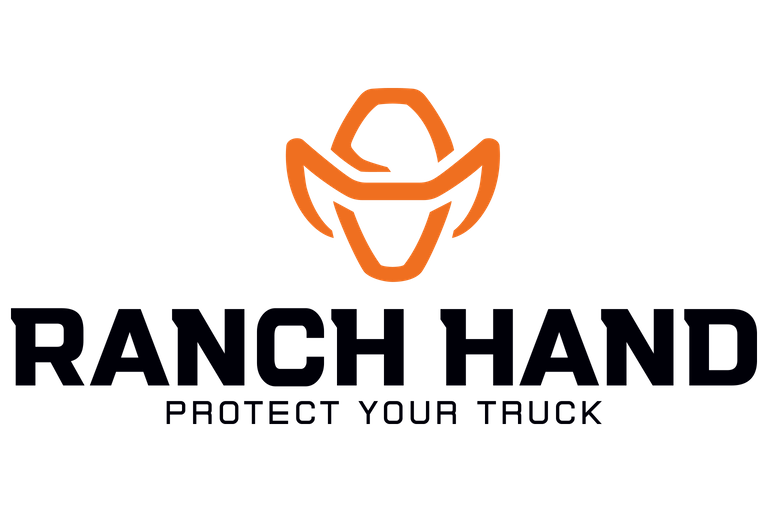 Ranch Hand is here to help! 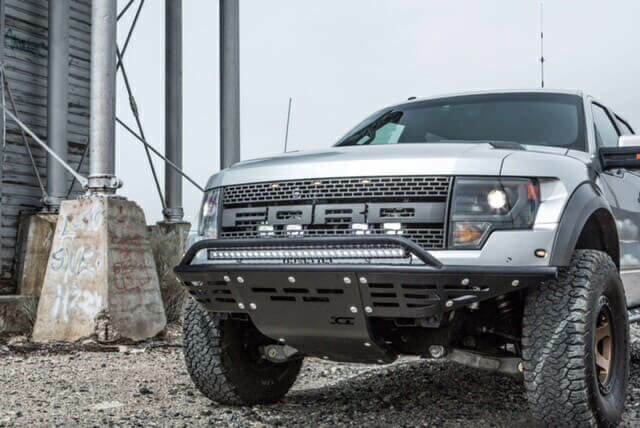 In addition to being the best vehicle-protection products on the market, Ranch Hand grille guards, bumpers, and running steps grab attention with sleek, durable designs that are built to match the make and model of your vehicle. Which Vehicles Will Ranch Hand Sponsor? Ranch Hand has multiple product series for builders to consider, from the modern smooth-steel Horizon Series to the classic Legend, Sport, and Summit Series. Their front and rear bumpers and running steps are meticulously engineered to provide outstanding protection and performance to the trucks they equip—and everyone at the 2018 SEMA Show will notice. Ranch Hand wants to team up with you to make an impression at SEMA this November. Contact their marketing team at (210) 305-9153 or mavis@ranchhand.com if you’re interested in a sponsorship. 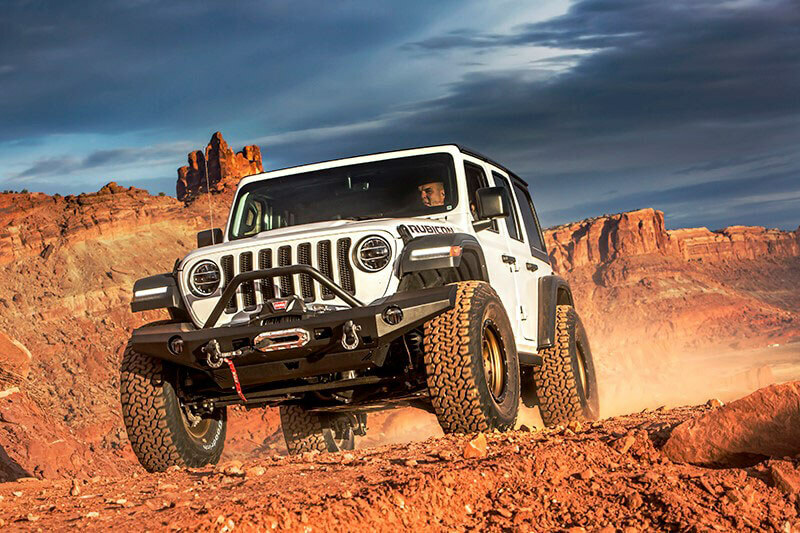 Whether you’re on the trail, on an overland expedition, or just looking for a sturdy place to mount your WARN winch, the WARN Elite front bumper is what you’ll want on the front of your Wrangler JL. 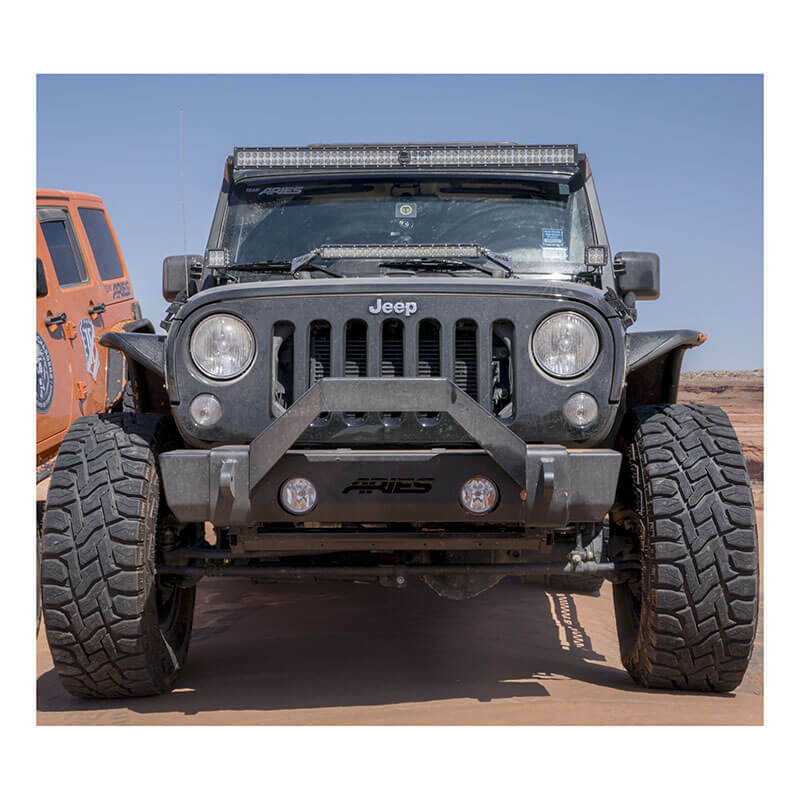 Designed, engineered, and made in the USA, the WARN Elite front bumper offers the features Wrangler owners need—along with a great new style that’s perfect for life off-road. The bumper is available in full-width versions (with or without a welded-on grille guard tube), as seen above, or in stubby versions (with or without a grille guard tube), as seen below. Advanced bumper geometry designed specifically to increase approach angles and articulation. Will accommodate 37″ tires with only a 2″ lift (full-width version). State-of-the-art flat-black powdercoat features a five-step pretreatment process with zirconium nanotechnology. Stands up to 408-hour salt spray testing, with excellent UV protection. Precision-welded eyelets for shackles allow for increased recovery options. Recessed light buckets for OE fog lights or aftermarket lights (full-width only). Integrated off-road jack points for easy access when jacking up your JL. Optional integrated grille guard tube features a low-profile look. Bar is welded on and adds protection for both the vehicle and your WARN winch. 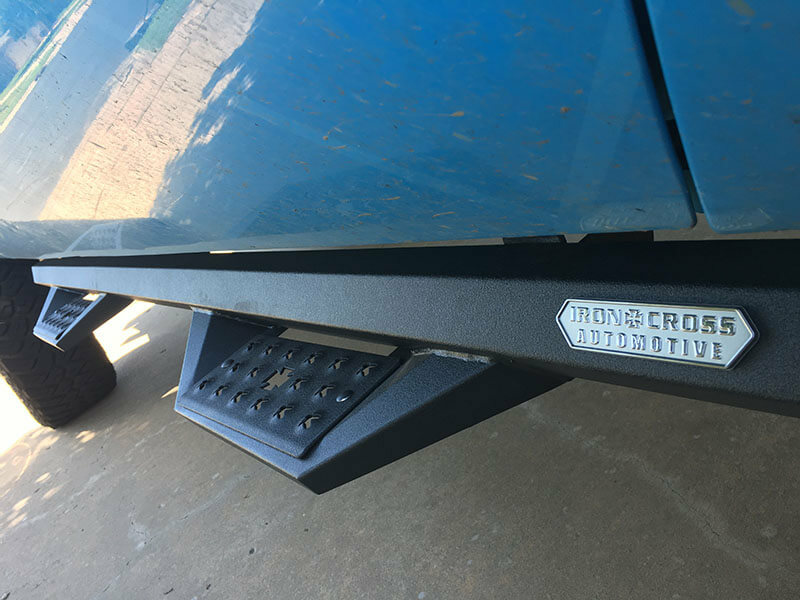 Lower bumper skid cover provides an integrated look and protects critical components like sway bar disconnects (sold separately). 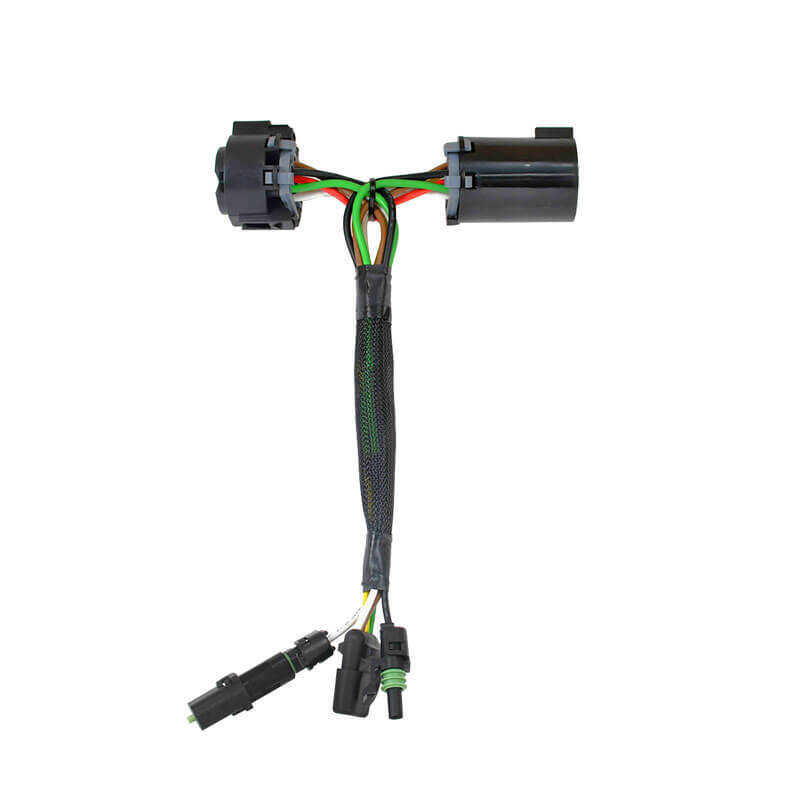 With a four-pin connector for your Blade or Red Blade tailgate light bar that keeps your OEM connection intact, the Blade Quick-Connect Harness from Putco cuts installation time for those products down to just a few minutes via plug-and-play convenience—no splicing or cutting required. The patent-pending 529004 harness features heavy-duty, 16-gauge, 100% copper trailering wire; weather pack connectors; a universal fit; and a one-year warranty. Cuts installation time to a few minutes. 4-pin connector for Blade or Red Blade tailgate light bar. Plug and play—no cutting or splicing. The new winch-ready bumper replacements for 2017–2018 Ford Super Duty from Go Rhino are now shipping! Available for the front (BR10.5) and rear (BR20.5), these bumpers feature a textured black powdercoat for the ultimate in style and protection. 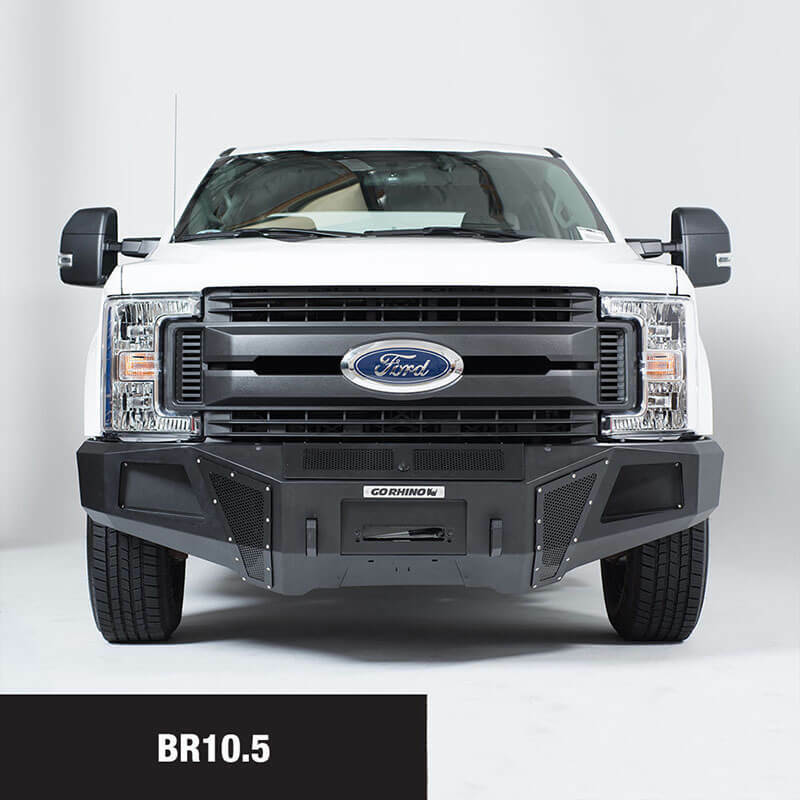 Up front, the two-piece-steel B10.5 bumper comes with a winch tray (16.5K lb. capacity) with mounting brackets and a cover for use with or without a winch, a front-facing 2” receiver, framed mesh vent covers for improved airflow, and patented heavy-duty Rhino Horn tow hook and shackle mount. In the back, the new-look B20.5 bumper supports factory license plate lights, allows the use of flush-mount LEDs without requiring an extra plate, and has integrated corner steps as bed-access points. 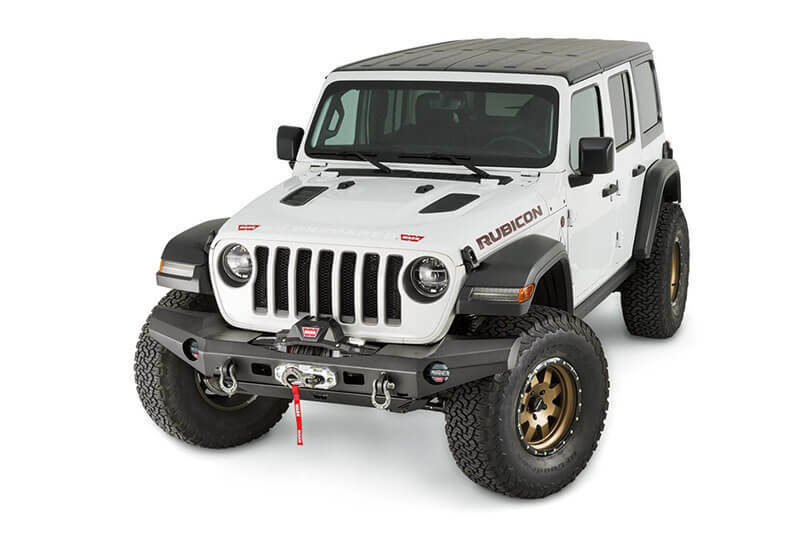 Additional features include a 1” steel shackle mount welded to each 1/4” steel mounting bracket, provisions for factory trailer light plug and rear park assist sensors, 3” light pods (lights sold separately), and an access point for spare tire winch. Bumper and winch tray ship as one part number in one box. Winch tray with 16,500-pound capacity and hinged steel mesh cover. Patented HD Rhino Horn tow hook and shackle mount. Textured black powdercoat (5-year limited warranty). 1” welded steel shackle mounts. Factory trailer light plug, license plate light, and factory rear park assist sensor provisions. 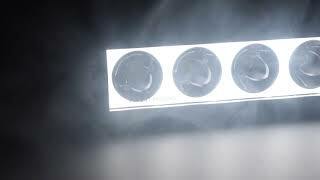 Allows installation of 3” flush-mount LED pods. 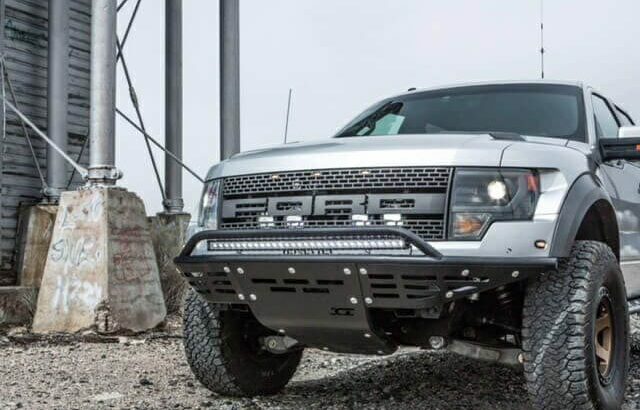 <p>The new winch-ready bumper replacements for 2017–2018 Ford Super Duty from Go Rhino are now shipping! Available for the front (BR10.5) and rear (BR20.5), these bumpers feature a textured black powdercoat for the ultimate in style and protection. Designed to match the aggressive lines of the company’s bumpers, these cab-length, heavy-duty (HD) side steps from Iron Cross provide ultra-strong cab entry assistance while making your ride stand out in a crowded category. Each board includes two steps per side. Now shipping in an all-new matte-black finish! Note: Step bracket kits sold separately. Featuring 2” low-profile housing, XPL Series LED light bars from Vision X boast a backlit, on-demand halo; 5-watt LEDs; up to 19,260 raw lumens; and more than 2,000 feet of usable light. This mount-friendly design comes with side wing mounts, bottom feet mounts, and wiring harness with lighted switch. Available in 6”, 9”, 13”, 21”, 32”, 40”, and 51” lengths; backed by Vision X’s extended warranty. 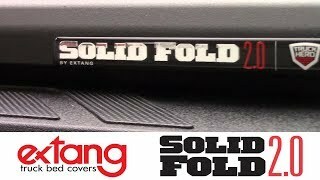 Come inside the Total Truck Centers™ garage as we take you through the installation of some of today’s hottest truck accessories In this episode, we welcome Todd Lindblade from Extang to the garage and we talk about the latest updates to the cover. The integrated winch platform features standard mounting locations to fit most winch types and welded shackle mounts that accept any shackle with a 7/8” diameter pin, with a winch-and-shackle rating of 12.5K pounds. The 2186000 is a custom-fit application for your 2017–2018 Jeep Wrangler JK. It goes on with no drilling and comes with a durable carbide powdercoat to protect from hazards seen and unseen. 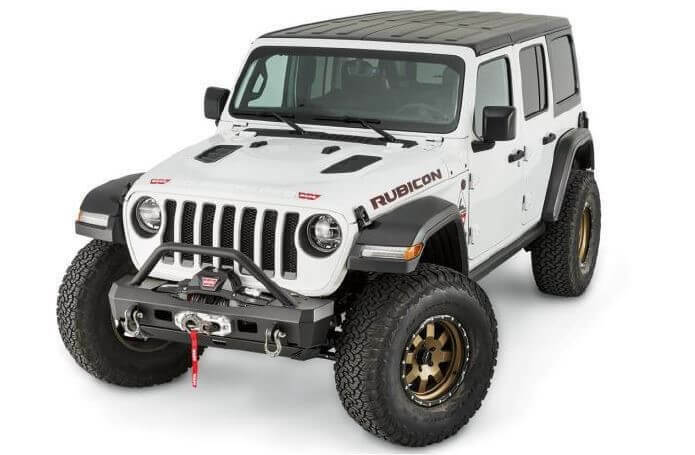 <p>With a stinger-style angular steel brush guard that adds an aggressive look and helps protect your winch out in the wild (winch not included), the 2186000 TrailCrusher front bumper from ARIES offers all the functionality and style you crave.